Los Angeles has always been something of a polyglot, and French immigrants were among the many who contributed to the formation of the city. It was commonplace in early L.A. to hear French spoken on city streets, and the Gallic presence was welcomed in enterprises from wineries to bakeries to public entertainment. In the late 19th century, railroads brought carloads of new citizens to L.A., and the city’s signature sprawl began to grow. Businesses sprang up near the railroads to serve and capitalize on the new arrivals. 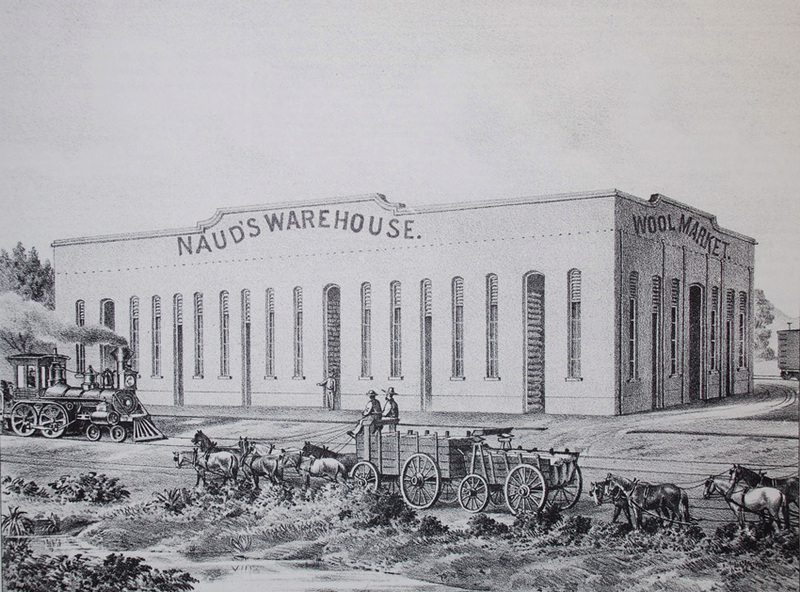 On the northern edge of the growing city, the Southern Pacific’s tracks swung off from Alameda at a junction known as Naud’s, or just “the Naud.” The junction got its name from a vast warehouse at Alameda and Main that was built around 1878 by cagey Frenchman Edouard Naud. Monsieur Naud had made his reputation (and beaucoup dollars) baking breads and pastries—he was especially famous for his ladyfingers, which were enjoyed across the Southland. Through working at the bakery, Naud learned about storing grains, and before long he built a warehouse for himself. It was a crazy combination of granary and storage facility; one side was filled with milled wheat and barley, and the other was packed with citizens’ valuables. Pianos, furniture, farm equipment, printing presses, organs, baby carriages, and steamer trunks were kept safely in the fireproof building. When Naud passed away in June of 1881, his widow teamed up with the Weyse brothers (O.G. and R.G.) to continue the enterprise. 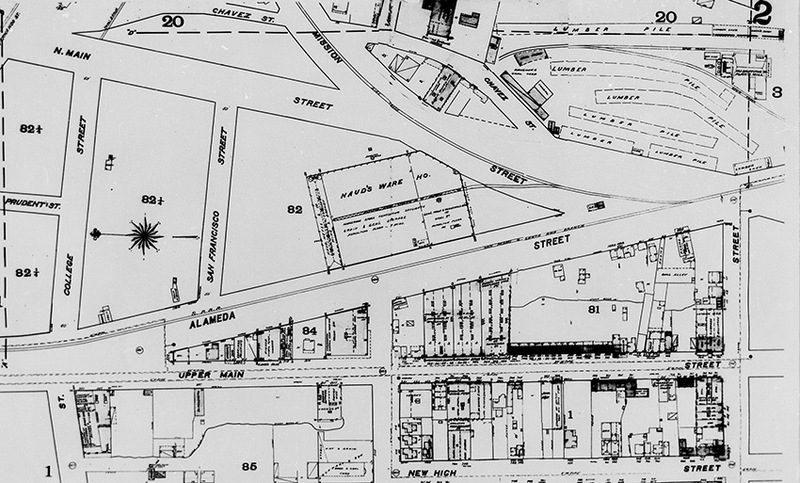 In 1905, boxing promoter Thomas McCarey constructed a pavilion at Naud’s Junction near the warehouse. The popular sport of boxing had been outlawed over at nearby Hazard’s Pavilion, where the bloody action had taken place in previous years. So Naud’s became the place in L.A. proper for big-time boxing bouts (though it was challenged by the nearby arena in Vernon). It even hosted heavyweight and middleweight championships of the world. It was a notable time in L.A. history. Venice debuted with a splash, plans for the aqueduct were unveiled, the Philharmonic Auditorium opened, and the process of annexing the harbor began. The big news in town, though, was the middleweight championship of the world between Tommy Burns and Hugo Kelly, which resulted in Burns wearing the crown. Later, he also won the heavyweight gonfalon against Marvin Hart at Naud’s, despite being outsized by 50 pounds. The greatest fight in Naud’s history seems to have been Abe Attell vs. Frankie Neil in a grudge match for the featherweight title. Yet the most spirited action in the ring at Naud’s may not have been boxing but preaching. In February of 1909, the famed evangelist Billy Sunday visited for a Saturday evening of fire and brimstone. That night he intoned that “every honest skeptic is willing to find out whether there is a God or not, and every man that won’t do it is a mountebank, a wind-bag, a blow hard, and a mollycoddle.” The “picturesque” preacher—an ex-big league ballplayer and ersatz cowboy—moved from Naud’s to the Shrine auditorium the next day for an indoor tent meeting. 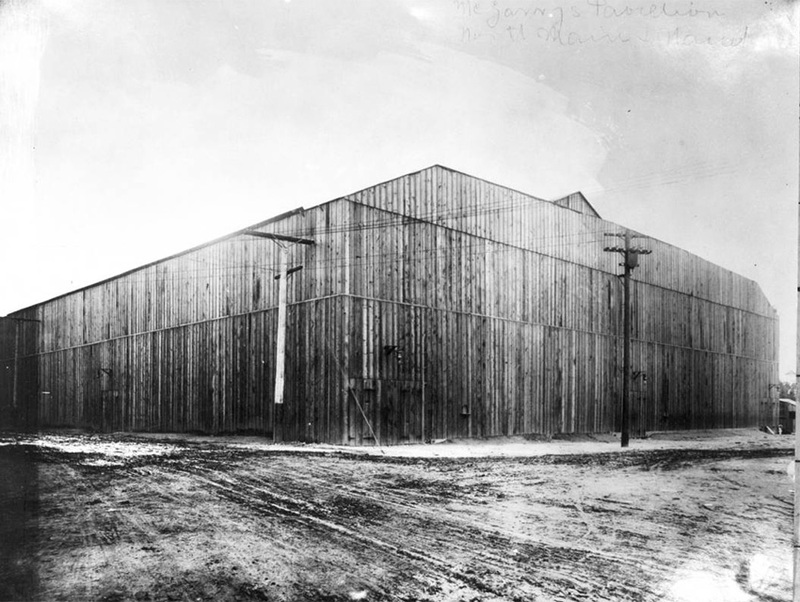 Naud’s Junction Arena continued as the city’s premier boxing venue until 1913, and it burned to the ground on September 22, 1915. 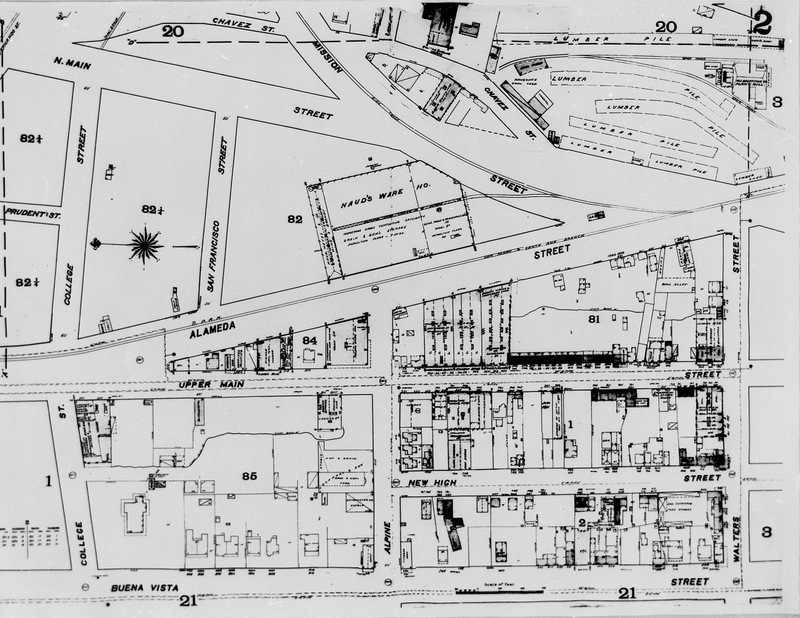 The name of the junction survived for years, until the entire area was re-configured with the construction of Union Station. Previous articleWhere Does the Grim Sleeper Rank Among Notorious L.A. Criminals?